Bee hives will be installed on the roof of the new ISTeC building in March, where their activity will be monitored remotely. Bee hives will soon be located on top of the new ‘Interdisciplinary Science and Technology Centre’ (ISTeC) building at the Clifton Campus, and Chris Hedley from the NTU Construction Services team asked NTU Associate Professor Dr Martin Bencsik about how useful the new ISTeC building is in helping with their bee research. Due to historical deforestation over the last few hundred years in the UK, the natural habitat for the honey bee has been taken away, so bees are dependent on man and specifically bee keepers to provide hives. One of the reasons we are keen to keep them is that they benefit numerous crops in the pollination that they do when they collect food (nectar and pollen) from flowers. From the hive, a bee can travel to a radius of up to 3 miles pollinating crops, which is a free of charge service that man (and the plant kingdom) benefits from. In comparison with pollen being carried randomly and ineffectively on the wind, the bees carry pollen directly to the crops, and it has been proven that larger and higher quality fruits can be achieved through the use of bees. In the UK, bees actually prefer urban environments due to the diversity of food for them in gardens, which have a multitude of plant varieties that flower at different times of the year. This is in sharp comparison with the countryside where there can be acres of single types of crops and the use of insecticides and weed killers that can also harm or kill the bees. In rural areas, most often, beekeepers have to feed the bees with a sugary syrup to keep the hives going through the winter season. In the early spring, beekeepers have to monitor every one of their hives on a weekly basis to manage swarming and any possible weaknesses, which with the use of protective clothing, involves removing the lid and visually assessing their status. This disturbs the bees, and with a large apiary sometimes having up to 1000 hives, is labour intensive. Winter is also the time when bee colonies can die, but the hives can never be opened due to the cold, and commonly it is not until March that a beekeeper will open the hive to find it has died a few months previously. 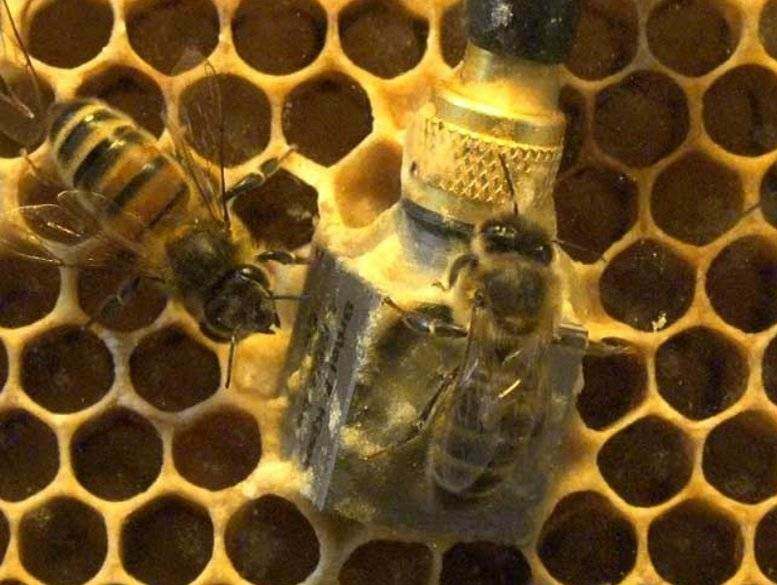 The purpose of the research is to be able to monitor the activity of bees remotely without disturbing them, via the use of small, coin-sized accelerometers (see picture above) which detect the vibrations caused by the buzzing and which indicate the activity of the hive. If the accelerometer detects sufficient or suitable activity, then there is no need to disturb the hive via inspection. By use of this technique, it can allow more efficient beekeeping and improved survival of the bees in winter. Even at a small scale of 1-5 hives for amateur beekeepers, there is always a desire to know if their ‘pets’ are okay. This technology will also make beekeeping more attractive to the younger generation. There is also evidence that within the vibration created by the bees are pulsed signals, e.g. ‘whooping signals’, and this is leading to fundamental discoveries about how the bees communicate with each other. Dr Bencsik and his colleague Michael Newton in the School of Science & Technology, monitor hives of honeybees at the Brackenhurst Campus and wanted to find a satisfactory site at Clifton that is isolated from people/visitors, has ease of access from their research office in Clifton, and has an electricity supply for the research equipment. At the inception of the Clifton ISTeC building design development, it was a project requirement to provide space on the roof for the bees that could be easily accessed by the staff. 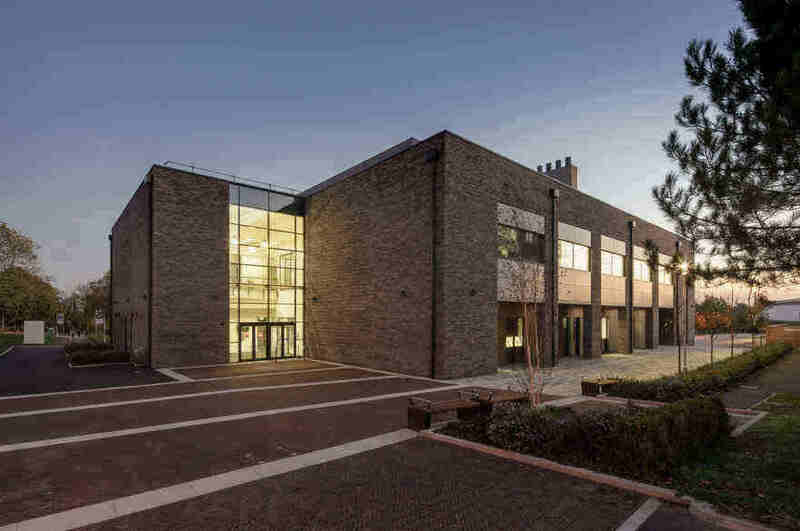 The facility offers a location central to the campus for research access, though isolated from people in general, with an electric supply and planted wildflower areas around the building for food for the bees. When the bees arrive in Spring, this facility will allow NTU staff and students to continue to be world leaders in this pioneering research.